With help from this article you nailed your phone interview and made it to the next step: the in-person interview. There’s no question that proper preparation is key to landing the role, but make sure a focus on memorizing every bullet point on your resume doesn’t cause you to overlook the importance of your first impression. This may require a certain amount of judgment on your part. If you have inside knowledge that the office is extremely casual, a three-piece suit may not be required. However, if you’re not absolutely certain of the dress code, opt for a tailored suit. Not only will you look organized and put together, looking sophisticated will help you feel more confident. When choosing your power suit, don’t forget the accessories. Although most interviewers aren’t specifically looking for a Rolex, the little details like polished shoes, a matching belt and a tasteful watch can add to an overall positive impression. One study, for example, indicates that shoes may be used to accurately evaluate certain characteristics in others, so make sure you’re sending the right message at first glance. Better yet, be five to ten minutes early. The Monster UK research noted above found that a candidate’s timekeeping was the most important factor that helped influence a positive first impression. Without saying a word, you can help indicate that you have good time management, you’re considerate and you’re organized. Of course, circumstances beyond your control may arise. If you know you’ll be late, call and advise the interviewer as soon as possible. It may not be ideal, but being courteous in advance is always better than asking for forgiveness. As a quick addition, being a bit early is great, but being an hour early is frustrating for everyone. Your interviewer may not be able to see you prior to the agreed time, and you may be stuck awkwardly waiting in the lobby. Of course you should be nice to the interviewer, but this advice applies to everyone you come across in the building. The people in the elevator, the receptionist and those milling in the lobby may not be the hiring manager, but their opinion might matter more than you think. As you approach the office, you won’t know who’s around you – they could be a partner, an associate or a clerk – and people are great at remembering negative experiences. Holding the elevator door for the interviewer’s assistant may not get you the job, but the more good impressions you can make, the better. 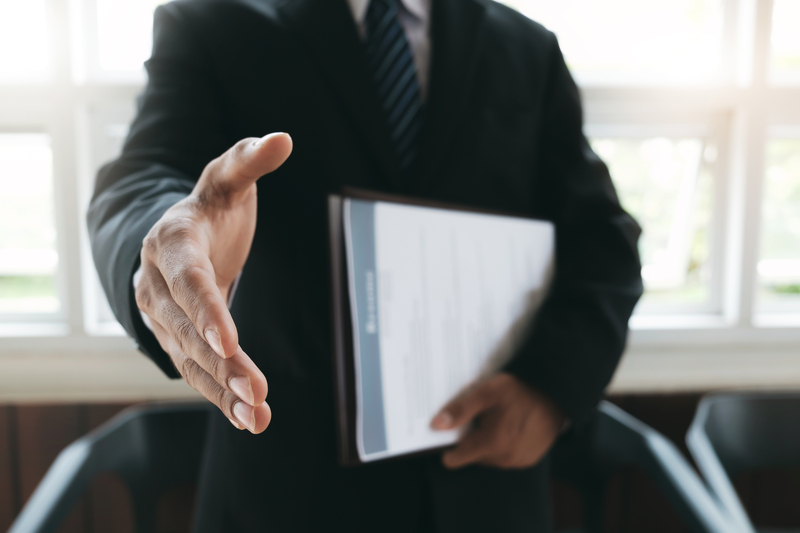 It’s important to remember that the interviewer is deciding whether or not you are a good fit from the moment they introduce themselves, so things like the firmness of your handshake and your ability to maintain eye contact are important when it comes to making a good first impression. Another important factor is the small talk. It’s easy to blow off the typical questions about sports and the weather but research found here suggests that the quality of this banter may influence the interviewer’s opinion of your answers to formal questions asked later. Work on building rapport early by giving more than yes or no answers. “No, it didn’t take too long to get here, I live just down the road. Do you live in the area as well?” or “Yes, the weather’s been great this week. Have you had a chance to get outside and enjoy it?” are easy ways to get a conversation going and let the interviewer see who you are as a person, not just a resume. Building rapport will also help each of you find common ground, making everyone much more comfortable when it gets down to the tough questions. All that being said, this is not an invitation to tell the interviewer your life story. Keep the chat light-hearted, natural and succinct so that it’s easy to segue into the formal questions when the time comes. Putting your phone away should be common sense, but it deserves repeating here. Even in the lobby, avoid the temptation to start scrolling. You don’t want to seem flustered trying to put your phone away, carry your bag and achieve a perfectly firm handshake when the interviewer shows up. Sometimes though, putting your phone away is not enough. It’s distracting to you and the interviewer to hear the constant “ding” from your group text, or to hear vibrations coming from the bottom of your purse. Your best bet is to silence your phone, including turning off the vibrations, for the duration of the interview. This extends to other “smart” accessories as well. If your messages connect to your watch, silence that too so you can stay focused and engaged in the conversation. The first impression may not be the deciding factor when it comes to landing your dream job, but it’s a great way to set yourself up for success. Melanie is a Recruitment and Communications Consultant with The Heller Group. She is involved in the recruitment and placement of lawyers into law firms and corporations. Melanie is also responsible for the corporate communications related to The Heller Group.